Today is World Water Day, an annual United Nations sponsored event to raise awareness on the importance of a well managed water infrastructure, as well as the severe lack of access to clean water in many developing nations. The environment is an important topic for us here at XYZ, so for this week’s #WebsiteWednesday, we are highlighting a duo that is examining the real life effects of sustainable energy in rural areas – TheHeliosProject.xyz. TheHeliosProject.xyz is an initiative launched by two students at HEC Paris, Pascal Boncenne and Achille de Rauglaudre. Pascal and Achille were inspired by the three challenges of energy, as laid out by Harvard Professor David H. Keith – access, security, and energy & environment. They saw the solution to all three problems in solar energy, so they launched The Helios Project as a way to study the effects of renewable energy in developing areas. 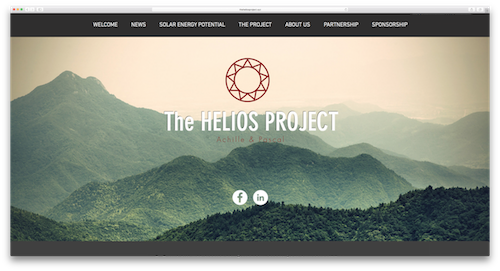 The Helios Project, which kicks off this month, will take them to Thailand, Zambia, and Brazil. They are funding this trip through the help of their sponsors – BGET, GE’s We Share the Power, and Shell partner Insolar. Pascal and Achille will volunteer with local humanitarian organizations and conduct a thorough analysis of the solar solutions in these areas. Additionally, a documentary of their travels and findings will be released once they are back home in Paris. We at XYZ want to wish the duo good luck as they start their adventure. We will for sure check out their documentary and hear more about their story. Pascal and Achille are two members of #GenXYZ that are using their .xyz domain to help make the world a better place. So for this World Water Day, why not get inspired by TheHeliosProject.xyz and register a .xyz domain to raise awareness for a cause you are passionate about? « Previous Post Next week: XYZ hosting SoCal Tech Meetup!